Probably few practices are sustainable for a species which a) is relentlessly expanding; and b) has an economic and social culture that reveres and requires consumption. But this op-ed, “The Myth Of Sustainable Meat,” caught my eye a few weeks ago, because it argues–for all my meat-loving, environmentally-conscious friends–that organic, grass-fed, meat, is not really sustainable. This is an important point. Factory farming is both a blight on the planet and a daily holocaust for millions of animals. And while small, organic farms address the toxic outputs, as well as the inhumanity, of industrial meat production, they do not really resolved the climate change impact of meat farming. And if all the world’s meat lovers abandoned factory-farmed meat, and demanded organic meat from small, humane, farms, meat-eating would still wreak environmental destruction on the planet (more pasture, fewer trees, more carbon output, etc., etc.). Click image for full-size version. The inevitable conclusion: while industrial meat-farming is an abomination for all sorts of reasons, the real environmental problem is that humanity eats WAY TOO MUCH meat. So the best thing our species could do for the planet and the animals is to stop eating meat. But the next best thing, a point made by many who wrote letters in response to the op-ed, is to eat a lot less meat. So go ahead, enjoy your grass-fed, happy-cow steak, if you insist on eating meat. It’s better for you and better for the animals. But don’t feel smug or righteous about what you are doing for the planet. The only way you get to honestly feel you are doing something with impact is if you cut your meat consumption to near zero, or zero (basically, eat like a Bangladeshi–see below). Sorry, that’s just the reality. As Jonathan Safran Foer wrote in Eating Animals, if you eat meat you can’t really claim to be an environmentalist. ← Do New York City Police Care About Bicyclists? I am wondering how the author of the quoted article came up with 10 acres per pasture cow. Is that really the national average? Or just a figure pulled out of a hat? Also, perhaps cows on larger acreage is due to not being able to grow anything else there–in which case, that land wouldn’t support feedlot cows or other crops, either. Also, not figured in is the acreage to grow grains to feed cows in feedlots. If it takes 75 square feet of land for grazing and feed to produce a quarter pound of beef (See Capper, Journal of Animal Science, December, 2011), that’s an acre right there for 125 pounds of beef. Figuring about 550 pounds of meat per steer gives you about 4.5 acres! Oh, and that’s not counting in the 100,000 gallons of water and energy needed–I’m sure this must be much higher for feedlot cows, but don’t have any stats. Also, I’d like to see comparisons of how much topsoil is lost to pasture grazing as opposed to farming to grow corn and soybeans. I am now buying beef at a rate of about 25 to 30 pounds per year thanks to deciding that eating grass-fed beef is healthy for me. That comes to about a half pound per week–two to three meals. I’m not so sure that we all need to be vegetarian. I think, rather, we need to use meat as part of our protein source (don’t have giant slabs of it) and grow it more responsibly. We also need to be using ALL of the animal–liver (10 pounds of meat that I would NOT eat from a feedlot animal), heart, bones for broth, etc. 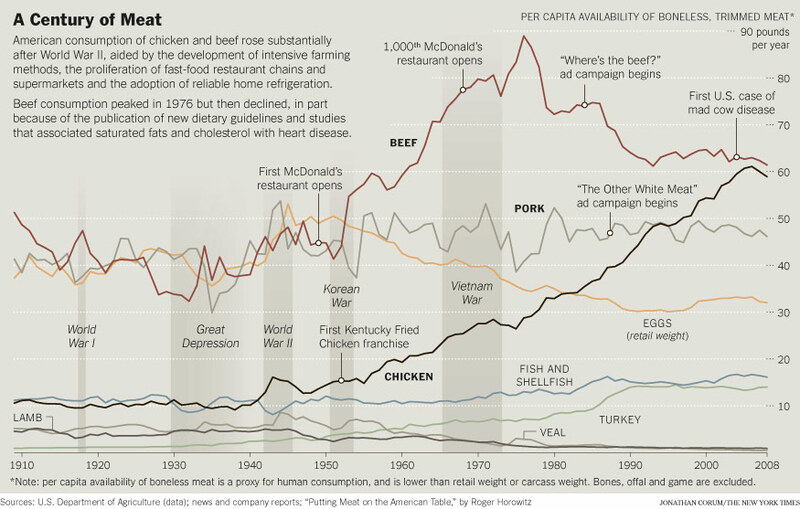 It’s amazing to me that Americans consume 270 pounds of meat per capita. If we all had half a pound a day, we could reduce that by about 100 pounds. If we had one meat meal per day with one to two eggs for breakfast, we could reduce our meat consumption even further while still having a considerable chance to enjoy eating meat. If we ate an average of 4 ounces per day, then we could consume about 100 pounds per person per year.